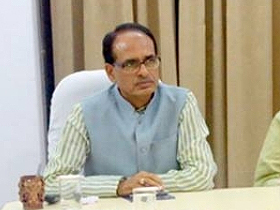 Putting a break on Congress bashing over law and order situation in Madhya Pradesh, former Chief Minister Shivraj Singh Chouhan today, turned his focus on congratulating and encouraging youth in his state. Taking to Twitter Mr Chouhan lauded Garvit Jain, a resident of Dewas, who topped the Chartered Accountant Foundation examination by securing 93.5 per cent. He also congratulated Nandita Masand of Bhopal, also a rank holder in the CA final examinations. Mr Chouhan said that Garvit Jain and Nandita Masand have made Madhya Pradesh proud. "Mere baccho tum badho, safal bano aur Madhya Pradesh ko badhao. Sabhi safal baccho ko ujjwal bhavishya ki shubhkamnaye, (Achieve success my children and take Madhya Pradesh forward. Best wishes for a bright future for all successful candidates)", the former chief minister said on social media. After losing the Assembly elections, Mr Chouhan, who is often popularly called 'mama' by his supporters had said, "Don't think mama has become weak," and asserted that in the upcoming Lok Sabha polls, the BJP will win at least 27 of the 29 seats in the state. Hitting out at the Congress government in the state under Kamal Nath, Mr Chouhan claimed that BJP could also have formed a "lame" government but it decided against it and would only form a government with a grand majority. Congress may have formed government in the state but it could fall "anytime as it lacks majority", he said. 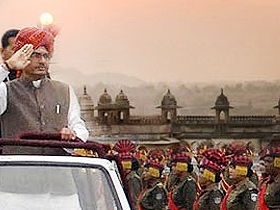 Mr Chouhan has been seen travelling in the interior villages of the state and posting pictures with the people. He held several small public meetings in hailstorm hit districts of Sehore and Rajgarh over the last few days, alleging that no one from the present government is interested about the farmers who lost their crops.